Dorji Applied Technology is a China-based company that primarily focuses on building different types of RF modules that can be easily incorporated in designing wireless data loggers, sensor network, telemetry and other wireless applications. 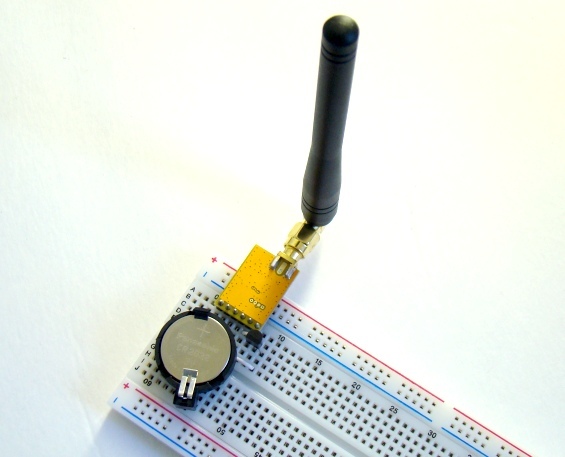 Their products mostly use RF transceiver chips from ADI, Infineon, and Silicon Labs. Some of their RF modules have an additional preprogrammed microcontroller that allows direct interface of selected analog and digital sensors to the module. This means you don’t need any external MCU or to write codes for these sensors. I have been playing with their DRF5150S and DRF4432S RF modules for past couple weeks and I should admit that they are very versatile and easy to use. 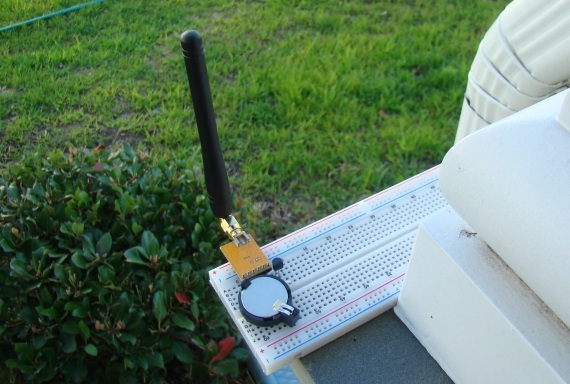 In this blog post, I will describe these two modules briefly, and illustrate how to put them together to construct a simple wireless sensor application where data from a remote sensor are received and displayed on a PC, without using any external microcontrollers. In data transmission mode the DRF5150S module acts as a normal data transmitter. 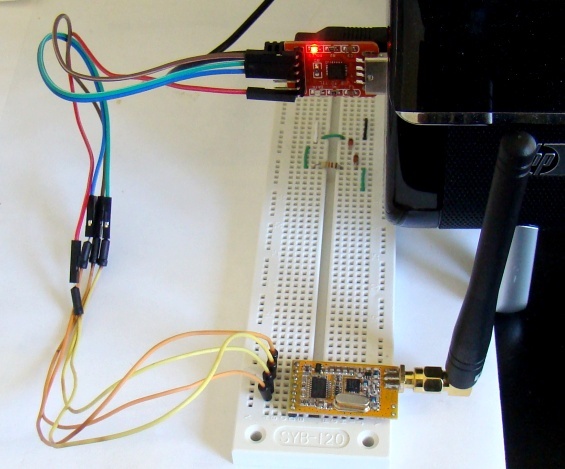 It receives data from a host MCU through a standard UART serial port and then sends them out to RF receiving module. The receiving RF module that can be used with DRF5150S is DRF4432S. We will talk about that later. The DRF5150S also features sleep mode during which no data is transmitted and the module consumes only 1.5µA of current. The preprogrammed STM8L151 microcontroller on board allows you to connect selected digital and analog sensors directly to the DRF5150S module, which is a very nice feature of it. 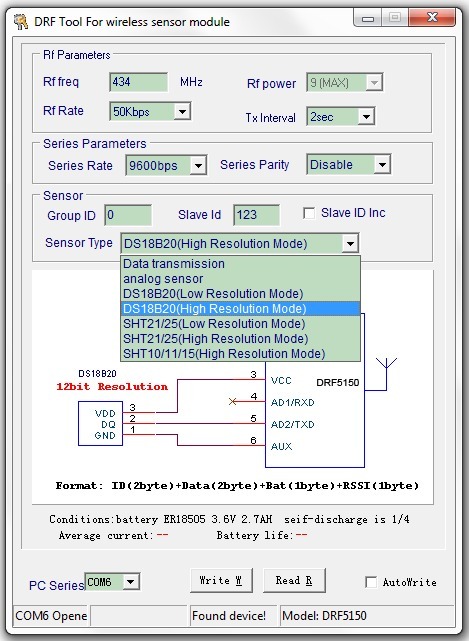 In this mode, the DRF5150S transmits the sensor data continuously at a preset interval along with its ID and the battery voltage information. The ID is useful to identify the source of transmission when there is more than one DRF5150S modules transmitting. The ID is divided into two parts: Group ID and Slave ID. The Group ID of the receiving module (DRF4432S) should match with the Group ID of the transmitting module otherwise the receiver will ignore the transmitted data. However, multiple DRF5150S modules can share the same Group ID, but they should have different Slave ID’s for identification on the receiving end. The module provides a 12-bit ADC channel that allows you to connect analog sensors, such as PT1000, LM34, LM35, TMP35, etc. It also features direct interfacing capability for DS18B20, SHT1X, and SHT2X digital sensors. The following picture shows the DRF5150S module and its pin configurations. The RXD and TXD are UART receive and transmit lines. They do have alternative functions based on the mode of operation. As I mentioned earlier, the DRF5150S provides multiple modes of operation. The module can be configured for a particular mode using a PC software, DRF Tool, downloadable from the Dorji’s website. The DRF Tool is a Windows based GUI application that communicates with the DRF5150S module connected to the PC through an USB-UART adapter. The TXD, RXD, VCC, and GND pins of the DRF5150S module should be connected to the corresponding pins of the USB-UART module. Note that the VCC voltage should be 3-3.6V. Here is a snapshot of the DRF Tool. All supported modes can be seen through the Sensor Type drop-down menu, and you pick one that you want to configure your DRF5150S module to. There are lot of other things that you can do with this tool, such as setting the TX interval, RF frequency and data rate, sensor ID, etc. For illustrative purpose we will configure the transmitter module to DS18B20 High Resolution Mode. 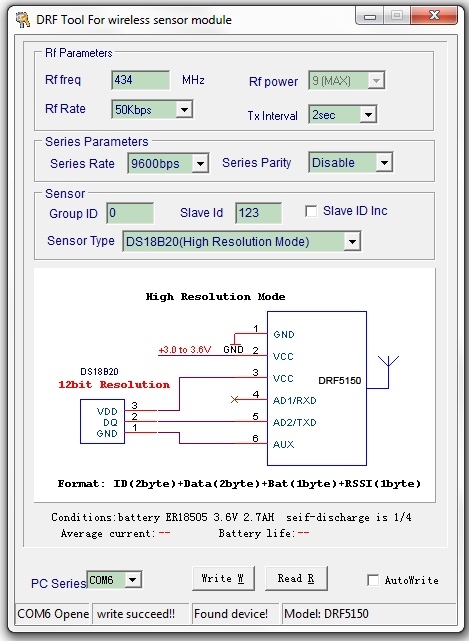 In this mode, a DS18B20 sensor can be directly interfaced to the DRF5150S module for measuring temperature with high resolution (12-bit). So we will select DS18B20 (High Resolution Mode) from the sensor type drop-down menu and set the transmitting interval to 2 seconds. Rest of the parameters are set as shown above. Now, we click on Write W button to send these configuration settings to the DRF5150S module connected to the PC. The STM8L151 microcontroller on board receives this information and saves into its internal EEPROM. The DRF5150S module is now configured for interfacing the DS18B20 temperature sensor. You should connect the sensor to the RF module as shown below. Altogether 5 bytes are transmitted for each temperature sample. 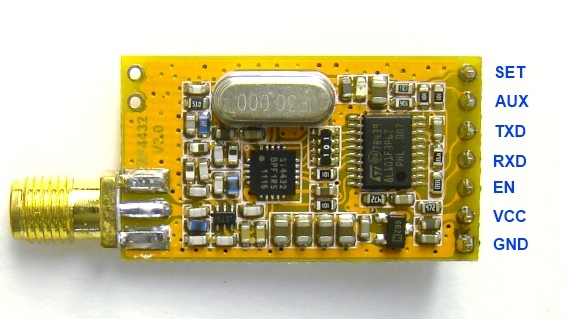 Now lets look at the DRF4432S module which is a matching receiver for the DRF5150S transmitter. In order to make this pair to work together, they must be configured identically. The DRF4432S is a GFSK receiver module based on Silicon Laboratories’ Si4432 wireless ISM transceiver chip. 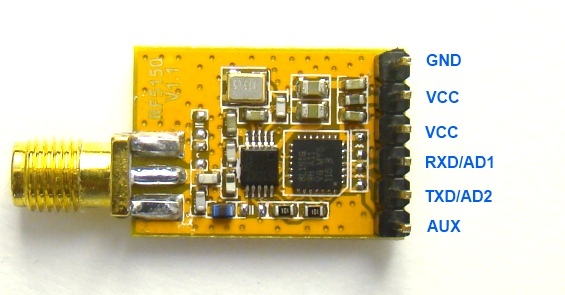 This module is used together with DRF5150S to build wireless sensor applications. It receives data from the DRF5150S transmitter module and transfers it through an UART serial interface. The picture below shows the pin diagrams of the DRF4432S module. Please refer the datasheet to find more details about these pins and their functions. The DRF4432S module must be configured in the same working mode as its complementary DRF5150S module. The configuration of the DRF4432S is done in the similar way using the DRF Tool. Again you need to connect the DRF4432S to the PC using an USB-UART adapter. Make sure you chose the same parameters in the DRF Tool for the receiver as you did for the transmitter. For our test application, the DRF4432S receiver module is also configured to DS18B20 High Resolution Mode, with RF frequency 434 MHz, RF data rate 50KBPS, and TX interval 2 sec. The transmitting and receiving modules can be configured to operate in a different frequency channel with 200 KHz spacing. We now interface the DRF4432S to the PC through the USB-UART adapter so that the received data bytes can be transferred to the PC. A PC application is developed using Processing language, which receives the data and displays them on screen. The Enable (EN) pin of the DRF4432S must be pulled low in order for it to work. If the EN pin is pulled high, the receiver goes in to sleep mode. Since the DRF4432S has got an on-board 3.3V regulator, it can operate from 3.4V to 5.5V. The following Processing code is written to receive six bytes of data from the DRF4432S receiving module connected to the PC through an USB-UART interface. 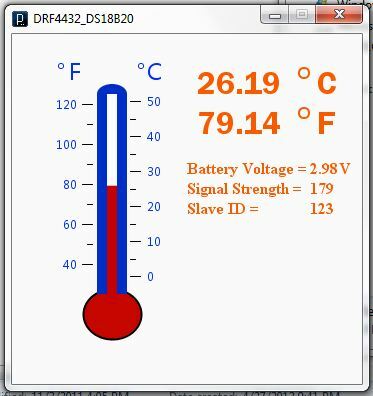 Information like temperature of the remote station as sent by the DRF5150S module, slave ID of the remote transmitting module, the battery voltage on the transmitting side, and the strength of the RF link between the transmitter and the receiver are extracted and displayed on the computer screen. 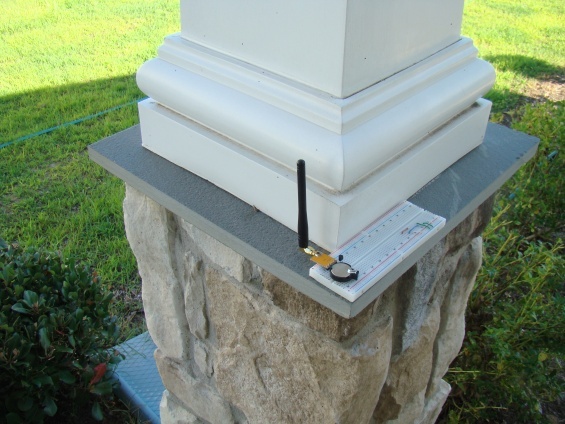 I tested the setup by putting the DRF5150S sensor transmitter module in the front door porch of my house and the receiver module is connected to the PC in my spare bedroom on the second floor. The distance between the two is around 70 feet no line-of-sight. The received signal strength is found to be 179 (out of 255), which is really good. DRF5150S and DRF4432S are two complimentary GFSK RF transmitter and receiver modules working in 433 MHz ISM band and are manufactured by Dorji Applied Technology. 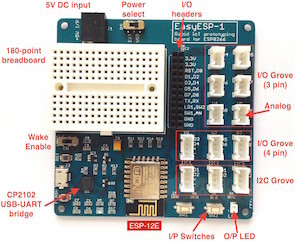 The presence of a pre-programmed microcontroller on board allows to connect selected analog and digital sensors directly to the DRF5150S module, which collects data from the sensor and sends out to the DRF4432S module at a configurable interval. The transmitter and the receiver can be both configured to operate for a particular sensor type through a PC software. For illustrative purpose, we constructed a very simple wireless sensor application where the DRF5150S module read 12-bit temperature data from a DS18B20 sensor and transmitted it continuously at an interval of 2 seconds. The DRF4432S receiver successfully received the temperature, ID, and Battery strength bytes sent by the DRF5150S module and transferred the data to a PC through an USB-UART interface. A Processing application was developed to display the received data on computer screen. More features and applications of these two RF modules will be explored in the second part of this tutorial. So stay tuned! Hi there, which is the maximum range you can obtain with this kit? Raj…..Another great project I’m excited to try out. Where did you purchase these units. My Google search came up empty for a sales source.